The Smartie cocktail gets its name from Smarties candies, which it supposedly tastes like. I’m not sure I agree with that, but I can tell you what it tastes like. This drink has a very sweet, mellow fruity flavor. You can taste the grape and melon individually if you really try, but it’s more enjoyable if you just let it all mingle on your tongue and do its thing. This is a really small shot and not particularly strong, so it’s a good choice if you’re wanting to toss back a few shots or just want one as a little aperitif. Note: there are clear and purple colored grape schnapps, and I recommend a clear one because green and purple do not make a beautiful color together. 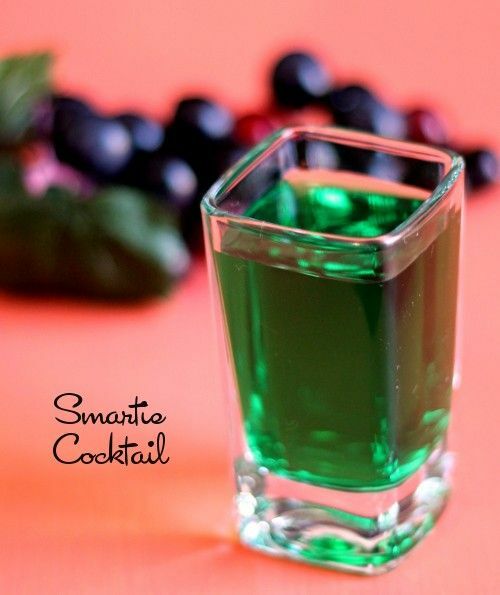 Pour the grape schnapps into a shot glass and follow with the melon liqueur. Stir and serve.